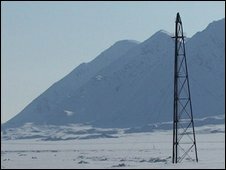 The BBC visits the most northerly human settlement on earth to see how scientists are measuring changes to our atmosphere. "No-one leaves the bar till I've got a gun!" It is 3am, the sun is shining, and a polar bear has been spotted heading directly to the camp. Welcome to a typical Saturday night in Ny-Alesund. Situated at 79 degrees North, Ny-Alesund is the world's most northern civilian human settlement, situated on the island of Spitsbergen - part of the Norwegian Svalbard archipelago - only 745 miles (1,200km) south of the North Pole. A former coal mining town, it has been converted into a sizable research centre, with up to 170 scientists living and working alongside the town's 30 permanent staff. And much of the research work is looking at changes in the climate. Bendik Halgunset, research advisor on the base and, right now, the man responsible for keeping us alive, comes back with a hunting rifle and - as I discover - a live round in the chamber. "It's for your own protection," he says. "The bears, they can move very fast." Escorted back to our rooms, we go to sleep - as best you can in broad daylight - to the "crump" and "thump" of fireworks designed to scare the bear away. The base is an international one. The UK and eight other nations have a permanent presence on the base, although many units are only manned during the summer. Being so far north has its advantages: researchers are in a near-pristine environment at the top of the world, enabling them to accurately measure changes in levels of carbon dioxide, dust, soot and chemicals such as PCBs. Five hundred metres above the camp is the Zeppelin Mountain Station that measures changes in atmospheric gases and pollutants. And the only way you can get to it is via a 20-year-old cable car which - we are assured - is "quite safe, if a little wobbly". The day before our visit, the site measured CO2 levels of 394 parts per million. 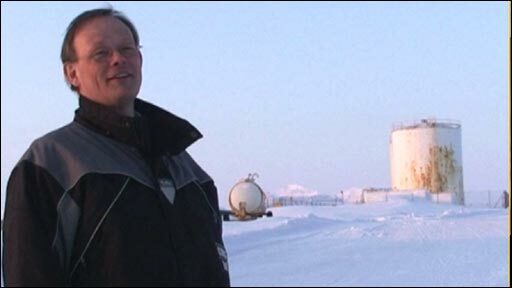 Johan Strom, the professor with Stockholm University's department of applied environmental science who runs the monitoring station, said it was the highest CO2 concentration yet recorded in the Arctic. "You have to go back millions of years to see the same values of CO2 that we are measuring today. "Stopping emissions would stop the CO2 levels increasing, but we would still have to live with all this excess CO2 for thousands of years, because CO2 is a long-lived greenhouse gas," he said. Professor Strom said that the effects of climate change were more pronounced in the winter. "The largest temperature changes happen in the winter. Yes, it's cold and we have snow, but you can see it with your own eyes: the glaciers are in retreat. "There is no excuse not to do something about cutting emissions and pollution," he said. Politicians are meeting later this week to discuss doing exactly that. On Monday, US Secretary of State Hillary Clinton said her country was "ready to lead and determined to make up for lost time" in its efforts to control climate change. President Barack Obama aims to cut US emissions by 15% by 2020, bringing them back to 1990 levels. Former US presidential candidate Al Gore, who produced the award-winning documentary on climate change An Inconvenient Truth, is due to address this week's meeting of the Arctic Council, with thinning of the Arctic pack ice high on the agenda. Norway's Foreign Minister Jonas Gahr Stoere said that the thaw would open "plenty of opportunities" in oil and gas exploration and allow shipping to traverse the Northwest Passage, but the overall impact would be damaging for the region. 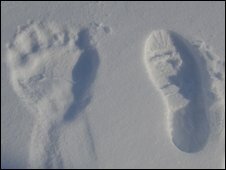 Of course, in the middle of winter, it would be hard for an ordinary person to spot evidence of climate change. 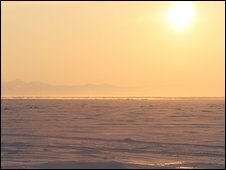 For two months of the year, the base is in total darkness and temperatures drop to -40 Celsius or more. With the nearest town nearly 30 minutes away by plane, the base has to be totally self sufficient. One thing missing from the camp is a mobile phone signal. The large radio transmitter dish, used for telemetry and satellite communication, is so sensitive that the use of mobiles, wi-fi, and Bluetooth is forbidden. Even turning them on can cause trouble. However, what the base does have is a top-notch broadband connection. 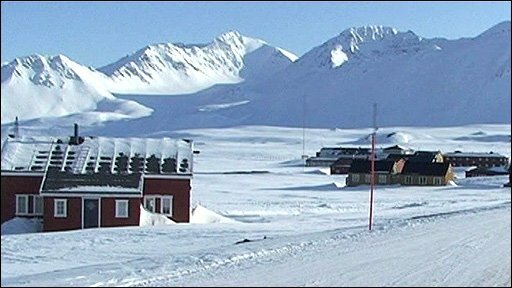 A series of microwave transceivers links the base to Svalbard's main town of Longyearbyan, which then has a cable connection to the mainland. Ny-Alesund's technical manager, Rune Drange, said running the site was challenging, but it allowed the researchers to do their work without worries or distraction. "We prepare all the food, provide power, water, everything they need," he said. The base goes through nearly a million litres of diesel a year, most of which is used in the power station. 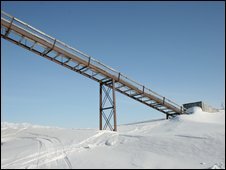 More than 50% of the station's output is used for making making hot water, with another 20% used to keep the pipes from freezing. "We use about a million litres of fuel every year. We tried using biodiesel, but it is just too cold; and we can't use gas because of the risk of explosion - there is no fire station in Ny-Alesund," said Mr Drange. "What we try to use is the cleanest fuel we can, very low in sulphur. And in the future, we are looking at installing wind generators." Debates on climate change show no sign of abating, and our need for fossil fuels is as great as ever; the recession has had more of an impact on consumption than anything else. Critics say that politicians are using climate change as an excuse to lump extra taxes on essential items. But talk to the researchers at Ny-Alesund and they say that reducing consumption can be achieved by thinking outside the box, looking for efficiency savings and - on a more basic level - making sure your house is insulated. On the flight back, I realise that the water I'm drinking has been shipped 1,500 miles (2,400km) from Denmark to Svalbard in a throwaway plastic container that contains less than two mouthfuls of water. The researchers may have a point.